Chatterbox | "blackberry-eating in late September"
I’ve just begun rereading Neil Gaiman and Terry Pratchett’s genius collaboration Good Omens for perhaps the sixth or seventh time. One of the characters introduced early in the novel is a Satanic nun named Sister Mary Loquacious from the Chattering Order of St. Beryl. In looking back through some recent posts, I’ve noticed myself falling a bit on the loquacious side, with posts extending perhaps a bit longer than you’d like for a casual evening read. So today, with three Bittmans to report on, I’m going to try to keep this brief. Two of my most hated food items as a child were cauliflower and curry. Cauliflower was drab and slightly bitter – worthless unless smothered in sharp cheese sauce, and even then a bit suspect. Curry powder was musty and unpleasant, and the two of them together sound like one of my youthful nightmares. I kept this selection on the list because N. loves the flavor of curry. But I knew that I would have to doctor up Bittman’s procedure to give this dish even a fighting chance. Brush a layer of olive oil on each of two cookie sheets and preheat the oven to 400F. Core the cauliflower and slice it across into flat steaks of about ½ inch thick. Some will collapse into florets. That’s okay, but ideally you want nice long, horizontal pieces of cauliflower. They look like flattened sprigs of Queen Anne’s Lace. 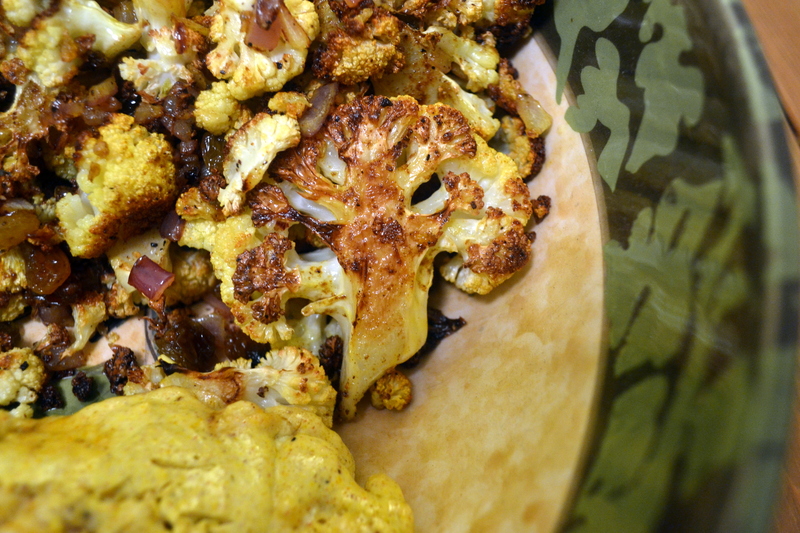 Toss the cauliflower with ½ tsp of the curry, salt, pepper, and more olive oil, then place on the tray in a single layer. Don’t crowd them too much – the more space they have, the better they will brown. Roast for 40 minutes, pausing at the 20 minute mark to flip each piece. While the cauliflower roasts and caramelizes and browns, sauté the red onion in a little more olive oil. When it begins to brown, toss in the raisins, the ginger, and the other ½ tsp of curry powder. Cook together for another 2-3 minutes until the raisins plump and the curry aroma mellows a bit. When the cauliflower is just tender and darkly golden, take it out of the oven and toss it with the onion and raisin mixture. We had ours alongside some roasted chicken breasts I’d marinated in yogurt and garam masala. 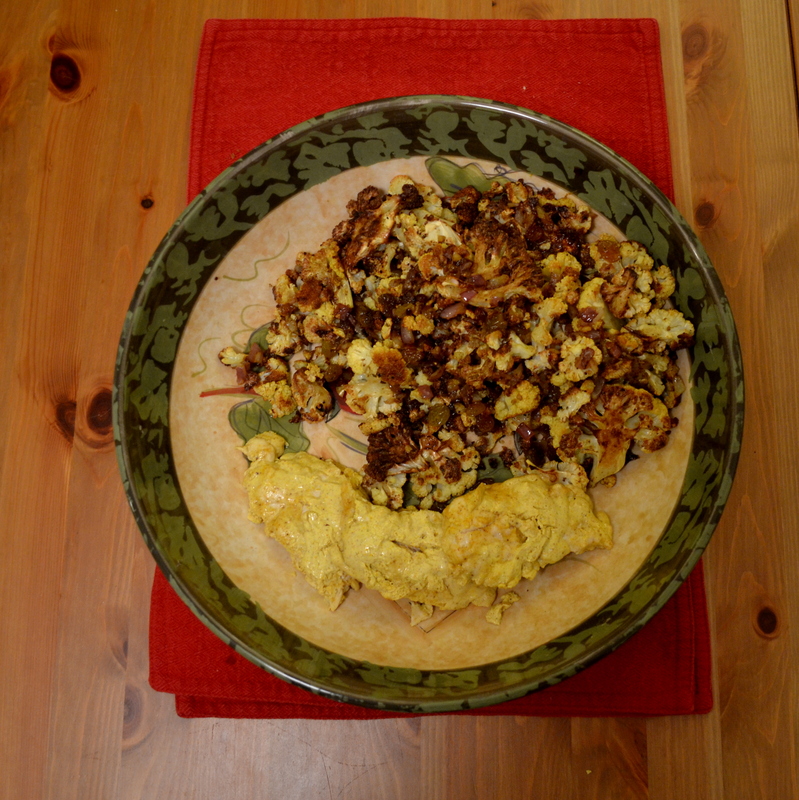 It was delightful – if you favor a strong curry flavor, add more to both the cauliflower and the onions. I was happy to have just a mild hint of earthy spiciness, and the unexpected sweetness of the raisins cut even this dankness in a very pleasant way. 16. Sauté equal amounts chopped, peeled apples and onions in butter until soft. Add stock or water to cover, then simmer for 10 minutes. Cool and puree. Serve sprinkled with Stilton or other blue cheese. We weren’t sure about this one. Nevertheless, we bravely decided to make just a small portion and see what happened. These quantities will serve two. Melt the butter in a small pot over medium heat. When it foams, it’s ready. Meanwhile, dice the apple and onion into small chunks. You want equal sized piles – we probably ended up with just over a cup of each. Add them to the pot and cook over medium, stirring occasionally, for 10-15 minutes. You want softening and tenderizing, not aggressive browning. When the apples are tender and the onions soft and translucent, add the broth and seasoning (though we didn’t make any additions, some thyme or sage might be very nice here – try 1 tsp of finely minced fresh herbs) and simmer for 10 minutes. 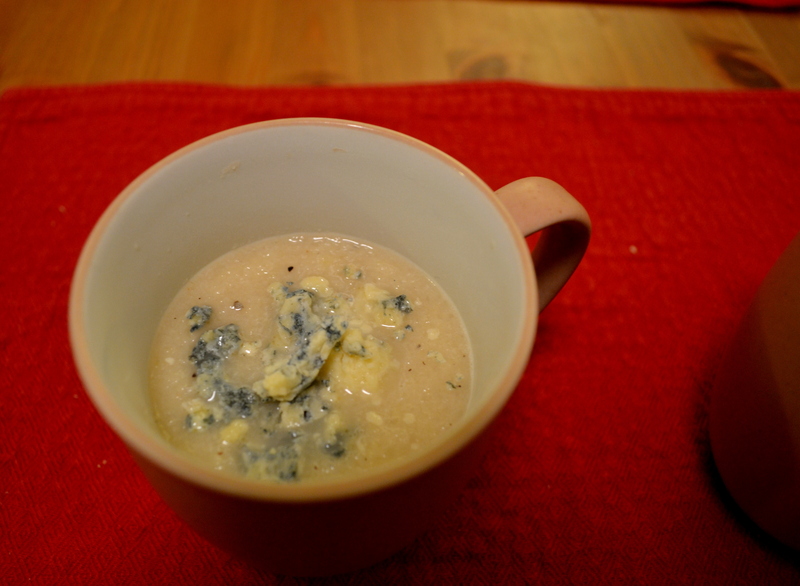 Remove from heat and cool slightly, then puree and serve with 1-2 TB blue or gorgonzola cheese sprinkled on top. We had a nice blue stilton. It wasn’t that we didn’t like this, it was that it seemed odd as a soup. It was slightly reminiscent of a butternut squash soup, but the apples were slightly sweeter than a squash, and the combination of their sweetness with the sharpness of the onion made this seem like an applesauce with too many ingredients. Left chunkier, this might be nice draped over a roasted pork tenderloin – a meat that goes nicely with both sweet and sharper, savory flavors. It might also be a good base for a butternut squash soup – the one additional player in this game could be the additional complexity it might have needed. 6. 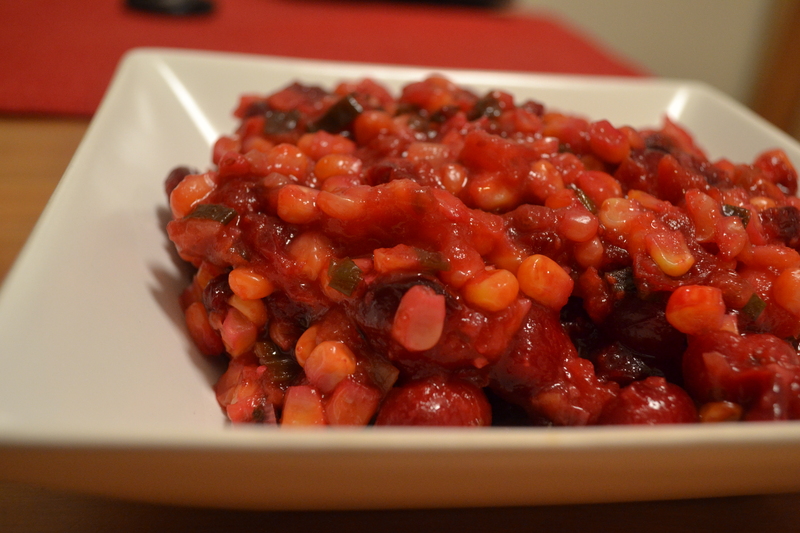 Cranberry-Corn Sauce: Cook a bag of fresh cranberries with about a cup of corn kernels, some chopped scallions, ¼ cup brown sugar (or to taste) and a splash of water, just until thick. Our third Bittman this week was part of a pre-Thanksgiving Thanksgiving dinner. When you grow up with a set collection of dishes that come to equate to this holiday, it can be hard to make a change. 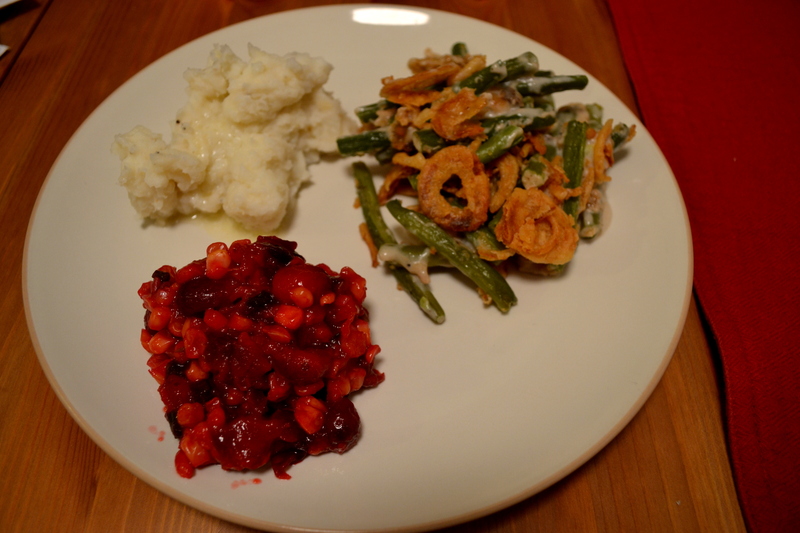 When N. started having Thanksgiving dinner with my family, he missed his mashed potatoes and green bean casserole. So I try, in the weeks that surround the holiday, to make up for these omissions. 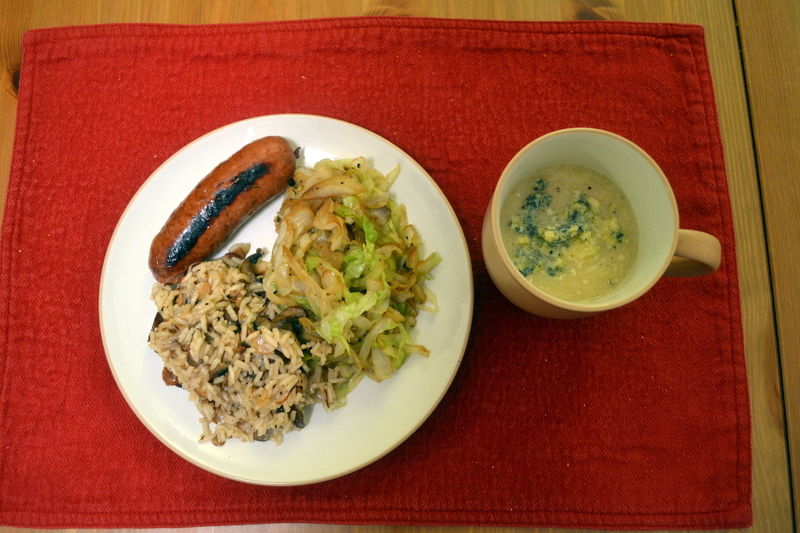 I make several smaller dinners featuring the dishes that don’t quite fit onto our holiday menu. This seemed like the perfect side – not traditional enough for our Thanksgiving table, but satisfying in the mean time. I tossed the cranberries, corn, water, and brown sugar together in a saucepan and set them over medium heat. I added the green onions at this point too, but were I making this again I would add them later – the 15-20 minute simmering time resulted in a slightly adulterated color, and the fresh greenness would be so much nicer. I advise adding them during the last five minutes of cooking time. I let this simmer for about 20 minutes, until most of the cranberries had popped and the whole pot was a sticky, almost syrupy texture. I let them cool off the heat with the pot uncovered for a few minutes, both because I like the flavor of cranberry sauce better the cooler it is, and because I wanted to let it gel up a bit further. These weren’t as sweet as your typical cranberry sauce. At least, they were not as sugary sweet. The corn added a beautiful vegetal sweetness that seemed at once the perfect fit and a strange accompaniment. We talked through this dish as we ate it, appreciating the maple overtones of the brown sugar and the tender crunch of the sweet corn, but thrown off slightly by the same qualities. What we finally decided, as we sampled second helpings, was that they were a delicious side dish, but they didn’t feel like Thanksgiving. Since the rest of the meal (garlic mashed potatoes and the old standard green bean casserole, slathered with cream of mushroom soup and the salty, salty crunch of french fried onions) was so traditional, having this difference, even in its subtlety, felt wrong. If you’re a stickler for tradition, this cranberry dish would have a better chance as a chutney for grilled pork or maybe even lamb. Next week is the big feast. Oddly (odd because the entire Bittman list was conceived for this single day), I had some trouble figuring out where to fit his ideas in. I’ve come up with a pair of selections to try out, and I will report back. In the mean time, what dishes will grace your menu on Thursday? This entry was posted in Cheese, Chicken, corn, fruit, Gluten-free, Recipes, roasting, Soup, vegan, vegetarian, Veggies and tagged apples, cauliflower, corn, cranberries, curry raisins, Mark Bittman, onion, stilton, Thanksgiving sides, vegetarian by Chelsea. Bookmark the permalink. I’m in charge of cranberries, green bean casserole and dessert. I’ve already eaten most of the French fried onions that I bought because I have ZERO willpower when it comes to those things (gross, I know, just scarfing down fried onions). I need to go and buy another canister now. 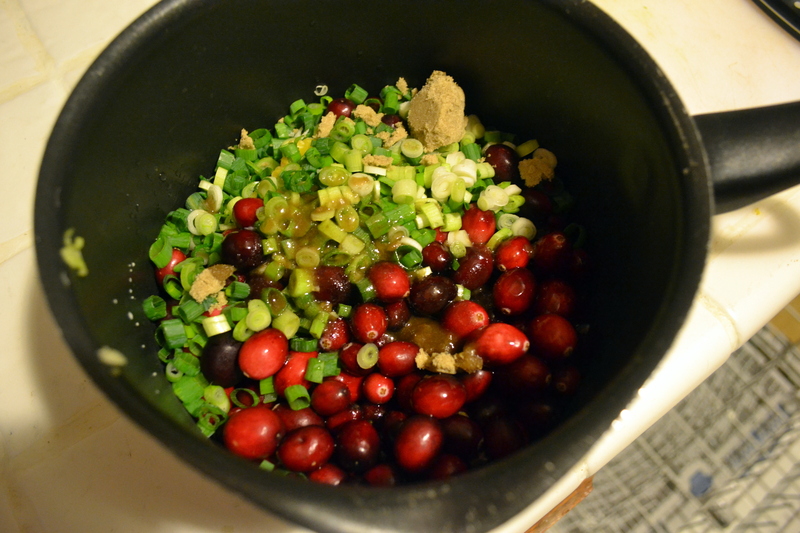 I’m making 2 kinds of cranberries; one from NPR (the weird one with horseradish and sour cream), and another from Madhur Jaffrey with garlic. Both half recipes. And I’m saving half a can of plain sauce in case my friends don’t like the two odd ones. For dessert, I’m making a cheesecake, which is admittedly heavy for Thanksgiving, but it’s the only dessert that my friend will eat. She has vetoed all pies, and isn’t fond of pumpkin and said she’s been craving cheesecake. So cheesecake it is. I also am bringing a Pinot Noir and some brown ale along as per Bev Mo employee suggestions. And a bit of chipotle sweet potatoes for myself, but the other two do not like sweet potatoes at all. Roasted cauliflower is soooo good. Also: green bean casserole 4ever! Pingback: Reflecting « "blackberry-eating in late September"